72 degrees? 77 degrees? 68 degrees? Set the state-of-the-art programmable controls on exactly the room temperature you want, and Friedrich's air conditioners will keep it there. 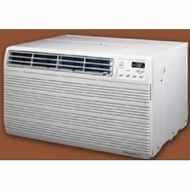 The air conditioner is programmable to fit your needs, including three cooling speeds plus three fan only settings, MoneySaver setting, Energy Star Qualified, stale air exhaust vent, and lift out filter. Programmable controls with 12-hour timer lets you program on/off times. Remote included.